The start of school kind of snuck up on me this year. All of a sudden it is the weekend before school starts and my kiddos are all in need of school shoes and information about their bus routes and very precisely sized binders. Sam is in a good place this year because he is continuing on in the same school where he went last year. He's all very casual and chill about the whole deal. I have been a little bit less chill because last May when Alex claimed that he walked into the school and changed our address, he actually did not, so I spent my summer worrying that the school mailed something that didn't get forwarded and I would buy the wrong sort of graphing calculator, which, it turns out is kind of a big deal. The big news in Samland is that he just found out that he made it into advanced (as opposed to intermediate) band. He couldn't be happier. He wants to play in an orchestra for a living, so advanced band is clearly Step One for him. We're all pretty delighted. We're also teaching Sam to ride a city bus in preparation for this school year. I took him on a bus the other day and totally fucked up on when to pull the cord to stop the bus. I pulled it something like four stops early and had to keep telling the bus driver that I'd made a mistake and Sam was all, "You're not doing a very good job of teaching me to ride the bus." A couple of days later, I dropped him off at the bus stop in the pouring rain with my cell phone, a bus pass, and a book. He refused the umbrella I offered. Upon his safe return home, he was absolutely delighted with the fact that he rode the bus by himself better than I had. Because of this city bus riding, we got a cell phone for the kid. Let me tell you, you haven't lived until you've experienced the Costco wireless kiosk as a family of five for an hour the day before school starts. It’s not a smartphone—more of a D-student phone, but it will text and let him take funny photos of the cats with it. 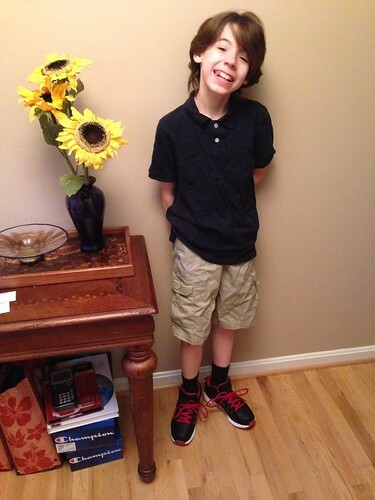 Jack is starting middle school this year, which is all very exciting. 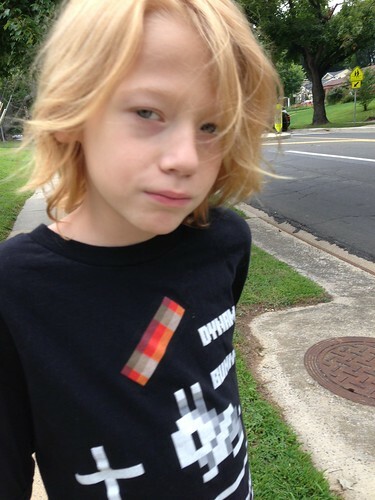 His bus drops him off right outside our house though, so he doesn't get a phone, much to his chagrin. Seriously. He was really pissed during that Costco expedition, making the whole trip even more fun. Jack seems to be pretty relaxed about going to a whole new school with a whole new system. Happily, both of his best friends are going to the same school, which is awesome for him. All the middle schools here have a half day for 6th graders the week before school starts so they can experience the school before the big, scary kids get there. He did so well. He came home happy and ready to go back. I am always amazed at how brave he is. We spent some time on Sunday putting Jack's binder together with a tab for each of his classes. 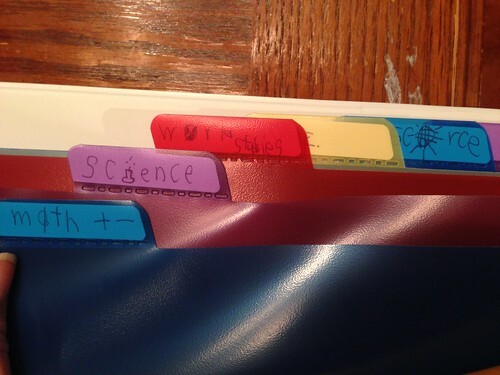 Being both a control and organizational neat freak, it was extremely difficult to let Jack write on his own binder dividers in his not super neat handwriting. (I have the same problem with Sam.) Once he got started though, I was glad I was able to stomp down my controlling tendencies because his binder dividers are better than any binder dividers I have ever seen. In case you don’t read Jack-writing, that “i” in “science” is a lab beaker, the “o” in “world studies” is a globe, and the “o” in “resource” is a disco ball, because of course it’s a disco ball. Why? What do you think happens in 7th period resource class? I don't even care that he misspelled "resource." That kid does NOT like school. Like, not even a little bit. Add in the fact that he's going to an entirely new school where he doesn't know anyone, has some severe sensory issues, and carries with him a healthy dose of anxiety and you can imagine how much he's looking forward to Monday. His new school has been under construction all summer, so it's been hard to get in there to let him walk around and see the place. I had taken him to the playground before, but last week was the first time he'd been inside. I'd made an appointment for him to go in on Thursday afternoon and have the counselor show him around and introduce him to his teacher before the craziness of open house on Friday. It was rough. He was in panic mode. He hid behind me and refused to look at or speak to anyone. However, I think it is good that we went in that day for several reasons even though it was so spectacularly difficult for him. 1. After seeing it Thursday, when we went in the next day for open house (with noise-canceling headphones on and an agreement about exactly what we were going to see, who we were going to talk to, how long we were going to stay, and what ice cream I was going to buy him afterward), he did a lot better and was significantly calmer and more able to interact with the world. 2. I was able to meet all of his teachers and pass out little one-sheet papers listing things about Quinn and how to help him. Regardless, I am hopeful for some real help for Quinn. His teachers have always worked hard to informally accommodate him, but I think we could have really stumbled into the right place (as far as local public school goes) for Quinn. This special educator is already talking about some significant accommodations. Who knows what will ultimately happen, but I am optimistic. That said, I am not optimistic about how bummed out this poor kid is going to be for the school bus Monday morning. I wish I could make it better for him. I took this outside his school after his open house. He was a trooper. He always is. So that is where we stand. Summer is over. It's been a weird summer and even though it went really fast and I don't feel as if I saw enough of my kids, I'm ready for them to go back so we can get back into a routine. Wish them luck Monday. And if your kids are going back to school Monday as well, I hope they do as well as possible. Let's send all of them wishes of bravery and kind teachers. I hope you get the supports he needs. We've been there on the losing end of accommodations. It seemed as though I was asserting my due process rights every freakin year over one of the boys (before I pulled them). It sounds like you have staff on your side though, which should help. Wow. It felt really weird to not type my blog address in there. That was the first time I've done that. Do people not know you lose the IEP FIGHT? Do people really believe special ed is all land of sunshine and rainbows? Because um, wow. I hope you and Quinn get exactly what you need. I often find that the blogs I read are written by people who have been successful in their IEP fights and placements. And I think there are probably a lot of blog readers who feel bad about themselves because things aren't going so well for themselves, which is why I think it's important for me to eventually write that post. Best of luck to you all! I send many wishes for a wonderful year full of exciting adventures, cool teachers, awesome classmates, pleasant levels of sensory input and advance warning of fire drills. We had the mixed bag in the IEP battles, and found that even with it in place, when disability is less obvious, it is MUCH harder to get one, or have it followed even when you have one. I hope everybody's day goes well tomorrow. We'll be sending "good day" vibes your way. And sending Quinn extra hugs. And Andy says we should send him bows and arrows to shoot the zombie pigmen. Apparently, Quinn is supposed to know what this means. Good luck to all your kiddos and I've got a little dude over here that is NOT looking forward to school either. We've got a week of summer to go before I am in your shoes. Good luck! And many thanks to you for doing the work you do. It is so very important. It might tell you my state of mind last night that as I was writing, I couldn't think of the word for people who write blogs. "Bloggers." Thank you for that. Dear lord. Quinn definitely knows what that means. Tell Andy thank you. That first week can be daunting, especially with a new school. Anyway, hope everyone has a great school year! Good luck to all your kiddos today. I hope they have great first days & that the rest of the year goes well. We start back after Labor Day. But the middle school ASD & 7th grade open houses are today. We will get to meet K's new ASD teacher. And by new I mean she was hired a week ago. I have completely lowered my expectations for this year. Good luck to you and all your awesome kids today!! I totally got those subject labels, BTW, without your explanations. Awesome! And I really, really hope Q gets the formal help he needs and deserves this year. We were so lucky last year that L's teacher pushed and pushed for a formal IEP telling us and the team that she was doing everything for him but that we needed to get it in writing as a legal document so we could make sure his future teachers did it, too. 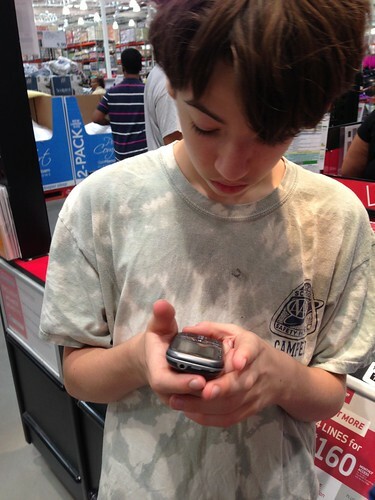 I'm laughing because we're looking at that exact same phone, at Costco no less, for our daughter! Since she will start walking home from school this year. And yes, the Costco phone kiosk is hell on weekends. Good luck to all your boys, especially Quinn. We're dealing with a lot of anxiety, too. I hope things go well for everyone! Oh geez. Hopefully your expectations will be exceeded. Good luck next week. That's exactly it. Informal accommodations are great, but not worth a whole lot if the next year's teacher isn't interested in doing the same. Well, we're one day into owning it and it hasn't broken or malfunctioned yet, so thumbs up!